Oh, World War II. You occupy a special place in the public consciousness, and this is certainly reflected in videogames. 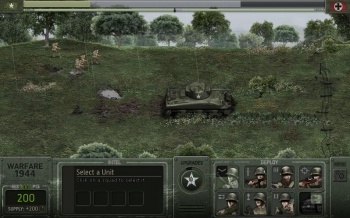 While the normal incarnation of the World War II game tends to be the ubiquitous WW2 FPS (bust a cap in some Nazis, yo) it's by no means limited to that - as we see here today in this week's browser game of choice, Warfare 1944. I guess you could call Warfare a real-time strategy game, of a sort. It is in real time, and there is an element of strategy about it, it's just... limited. Your reinforcement points regenerate over time, allowing you to call in different squads to one of three lanes on the map - Riflemen are your basic all-around unit, Assault are equipped for taking out enemy fortifications, Bazookas are good against tanks, et cetera. Your tactical flexibility is really limited to "stay here, okay now go forward" and which lane you assign to which squad, and it's certainly nothing we've never seen before. But it's still entertaining, and playing your way through the two campaigns as the Allied forces and the Werz... Weremac Werzhen... er, the Germans, should be a fine early-weekend time-waster. Oh, and because I've had it in my head since writing the teaser: Here you go.